Repair of the birdcage windshield frame continues in this update with the repair effort focused on the drivers side lower corner. By the end of the last update both of the old corroded lower corners were removed and the replacement corners had been partially prepped for installation. However, before installing the replacement windshield frame lower corner an area of repair needed to be addressed near the bottom of the drivers side windshield pillar. To complete the repair, I took the same approach that was used to fix the upper corners. The deteriorated area was cut out using a Dremel and then the spot welds were drilled out. Next, the deteriorated section was pried out of place with a screwdriver. A paperboard template was then created and used to fabricate a patch from 16 gauge sheet metal. Once the patch was cut to shape the necessary bends were formed using a vice, mallet and a hardwood block. After bending the patch piece to the required shape, several trips were made to and from the grinder which resulted in a pretty good fitting patch. Next, the patch piece was welded in place and the repair was ground flush. Overall, the fix came out pretty nicely. With the windshield pillar repair completed, the focus was shifted to getting the replacement lower corner piece installed. However, there was an area of heavy pitting located at the bottom of the horizontal cross member that was a bit too deteriorated for my liking; in one place the pitting was so deep there was a pinhole through the steel cross member. Rather than fabricating something from scratch I looked to the donor pieces that I had purchased. Since these components are identical to my 71’s original equipment, I decided to steal a portion of them to use as a reinforcing patch. To accomplish this a patch piece was cut and trimmed from the donor section and the surface rust removed to provide a good clean surface. The reinforcing panel fit real nicely. After a quick test fitting the panel was securely welded in place. The photo below shows how corroded the old lower corner was compared with the replacement corner. However, there are some differences between the windshield frame lower corners on a early model C3 (upper left) and a late model C3 (lower right) that will need to be addressed to ensure an accurate repair. You’ll notice that the early model lower corner has a raised rectangular section where it tucks beneath the lower windshield crossbar. Additionally, the shape of the raised triangular section is different. The triangular section can be addressed later, but before installing the replacement corner the raised rectangular section needs to be duplicated on the replacement. This modification really wasn’t too tough. A few pieces of 16 gauge steel were cut to shape and plug welded together to build up a section equal in thickness to the height of the raised section of the original lower corner. Next the two pieces were ground down to provide beveled edges similar to the OEM part. After grinding the filler piece it was clamped into position and securely welded in place. Here’s the custom fabricated repair piece after welding, grinding and cleanup compared to the original piece. It may not be an exact duplication, but for something that will be totally hidden in the final installation this should work quite nicely. 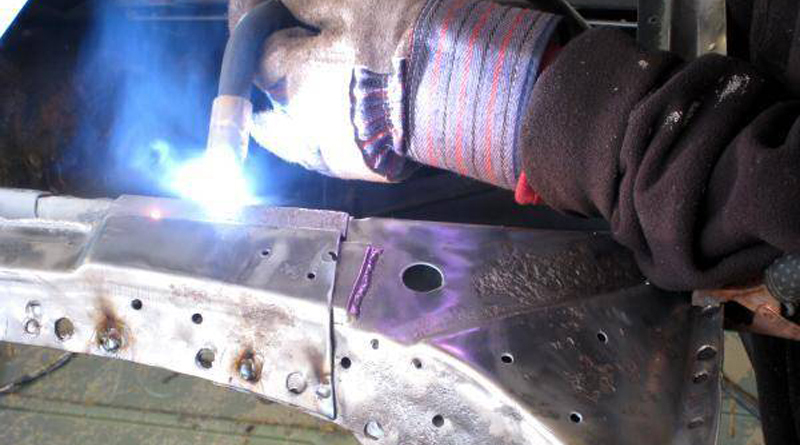 With the filler piece fabricated and installed the replacement lower corner was ready to be welded to the birdcage. To help preserve the integrity of the birdcage and prevent future rusting I decided to coat the interior face of each part with primer before installation. After several tries to get the fit just right, the replacement panel was securely clamped in place and plug welded all around. Before starting each plug weld I verified that all steel layers being joined were firmly clamped together. In some instances getting everything tight required repositioning a few clamps but the fitup turned out pretty nice. To help minimize distortion of the panel and birdcage due to the intense heat caused by the welding process only a few welds were completed at one time. Additionally, the welds were completed in a random pattern. With the replacement panel welded in place the drivers side repair is nearly complete. The work remaining includes grinding the welds flush and then building out the triangular section to match my 71’s original equipment. Things are moving along pretty quickly now. Stay tuned for another update!